Gallery of emotions for cosmetic make-up of female face. Cosmetic make-up should repeat emotions of a female face, namely should correspond to emotional impressions which arise at eyesight on facial features of a woman, but if physiognomic image contradicts emotions then her appearance seems unnatural. Open eyebrows - enthusiastic ideas. Sad eyes - oppression of desires. Quiet mouth - silent feelings. The open eyebrows and quiet mouth seem unhappy as eyes express sad emotions. The open eyebrows and sad eyes seem calm as mouth expresses quiet emotions. The quiet mouth and sad eyes seem frank as eyebrows express open emotions. The sad eyesight is quiet as ideas aspire in realms of fancy and move away from grief. The person easy realizes impossibility of real desires, as if desire longings are not carried out then feelings remain quiet. 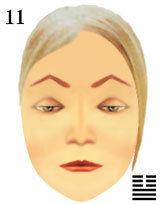 features of cosmetic make-up for impressions of female face.